When our son was spending his first New Year’s Eve in Japan, he reported to us on the local celebrations of this most important holiday. While we at home in the U.S. are staying up late to eat and drink, dance, and generally whoop it up with family, friends, and total strangers, in Japan the courtyards of shrines and temples are slowly filling with hundreds, even thousands, of patient, silent people waiting to make hatsumode—the first visit of the New Year. 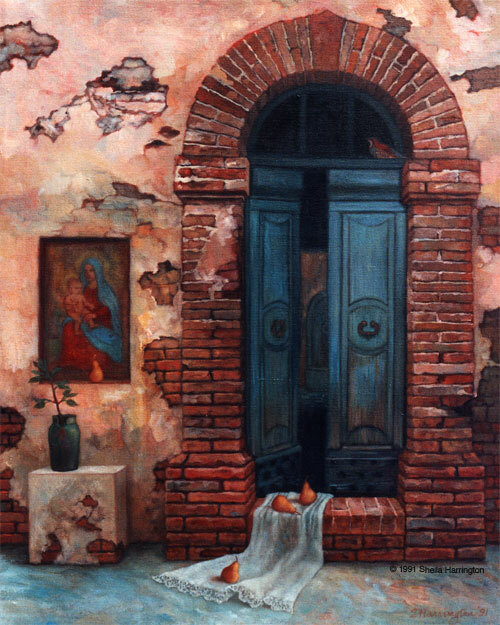 On the stroke of midnight, all over the country, the doors open, and the temple bells begin to ring. And they ring for a total of one hundred eight times, representing the 108 sins (such as vanity, garrulity, prejudice, ingratitude, and unruliness) from which humankind must be freed before achieving nirvana. 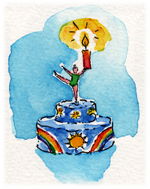 It’s part of a longer turning-of-the-year celebration during which people visit family, pay debts, eat special symbolic foods, and exchange gifts. (Although it seems that in Japan EVERY event—first trip to the dentist?—is an opportunity to exchange gifts.) What a contrast to Times Square, and beyond, where people are probably racking up those 108 sins right and left. 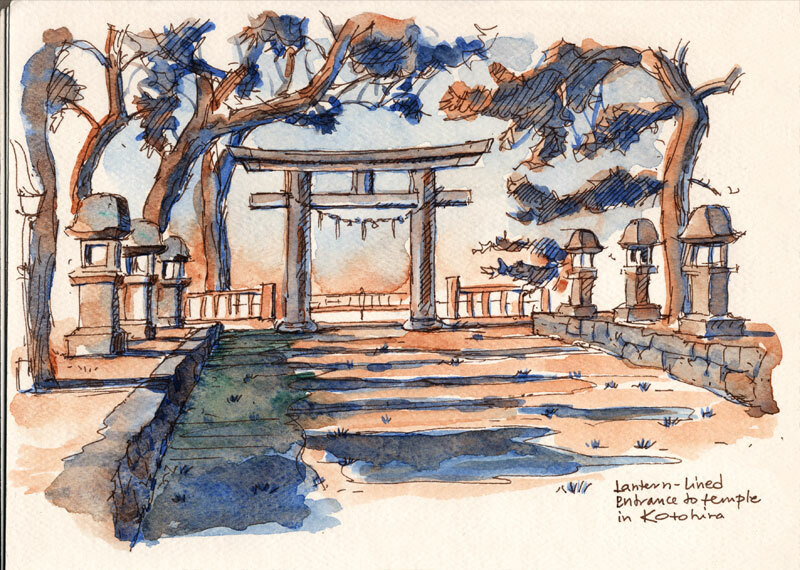 This is a sketch of a temple courtyard (but not on New Year’s Eve) from one of my Japan sketchbooks. 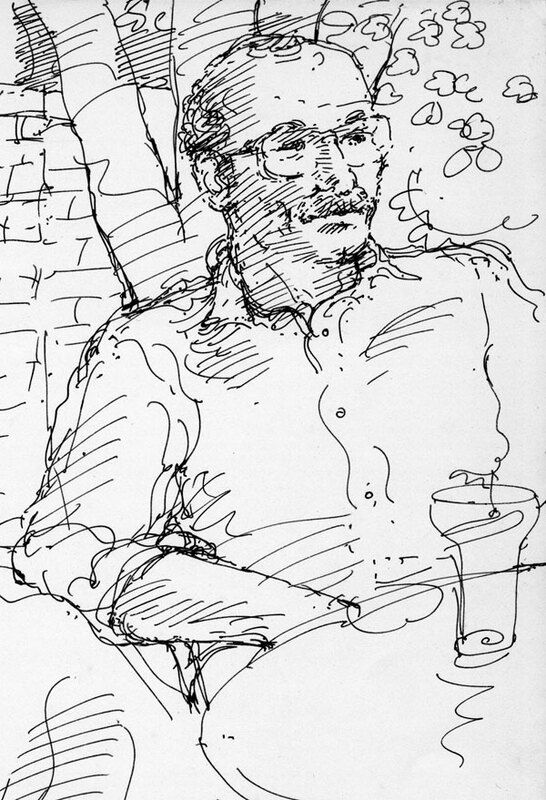 In going through a stack of old sketchbooks, I came across this sketch of Don—whose birthday it just happens to be today—sitting in his shirt-sleeves in his sunny garden, whereas at the moment he is undoubtedly surrounded by heaps of snow. Surprise! and happy birthday, Don! I hope you are having a lovely celebration despite the weather. And beware, anyone else whom I may have sketched. You may turn up here on your own birthday. 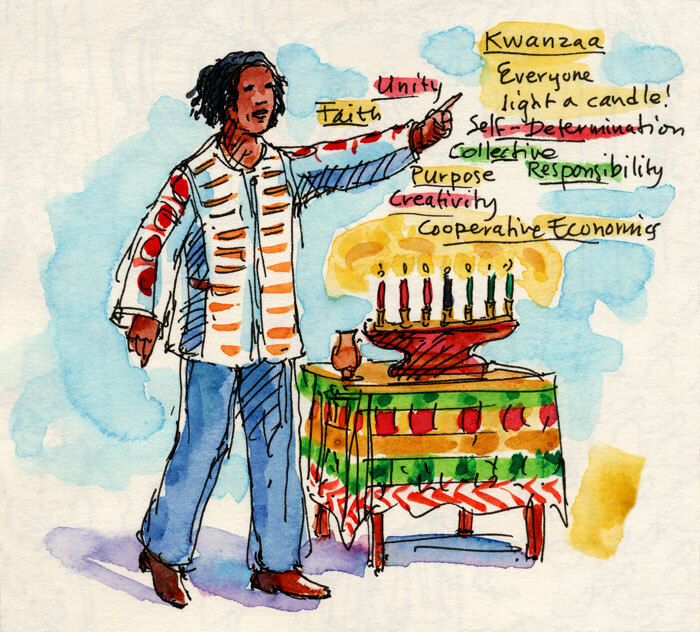 December 26th is the first of the seven days of Kwanzaa, a festival created in 1966 as a celebration of African cultural and historical heritage. Born of the Civil Rights movement, it was originally proposed as an alternative to Christmas for African-Americans who preferred not to follow the religious traditions of the culture that had uprooted and dispossessed their ancestors. However, for many families it has come to be an additional, rather than a replacement, celebration. Kwanzaa derives from a Swahili phrase meaning “first fruits,” and its creation was inspired by African harvest festivals, but “fruits” carries a larger meaning beyond the literal, encompassing as well the blessings of family, faith, work, and cultural heritage. 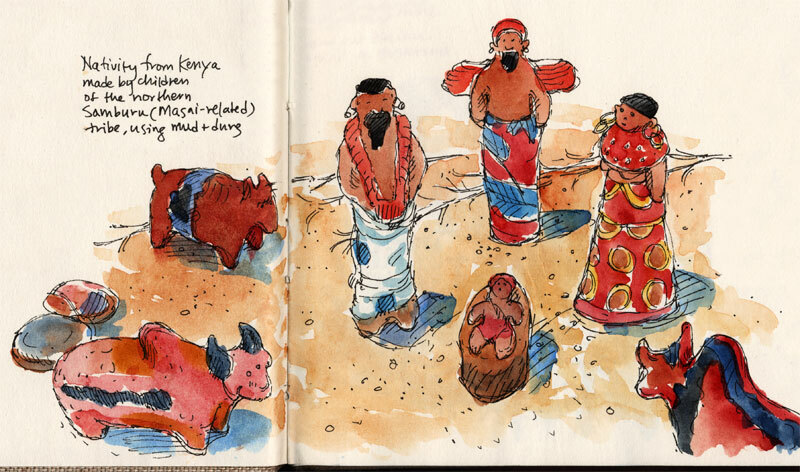 Each of the seven days has a special theme and is celebrated accordingly, through openly renewed commitment to significant values, storytelling, the exchange of gifts, special foods, and appreciation of traditional African art and handcrafts. Kwanzaa has been labeled disparagingly an “invented” festival, but this criticism seems both mean-spirited and short-sighted. Every festival we celebrate was “invented” at some point as the outward manifestation of a people’s beliefs, hopes, and dreams. Somebody had to be the first to drag an evergreen branch indoors as a reminder of the the eventual return of spring and new life. 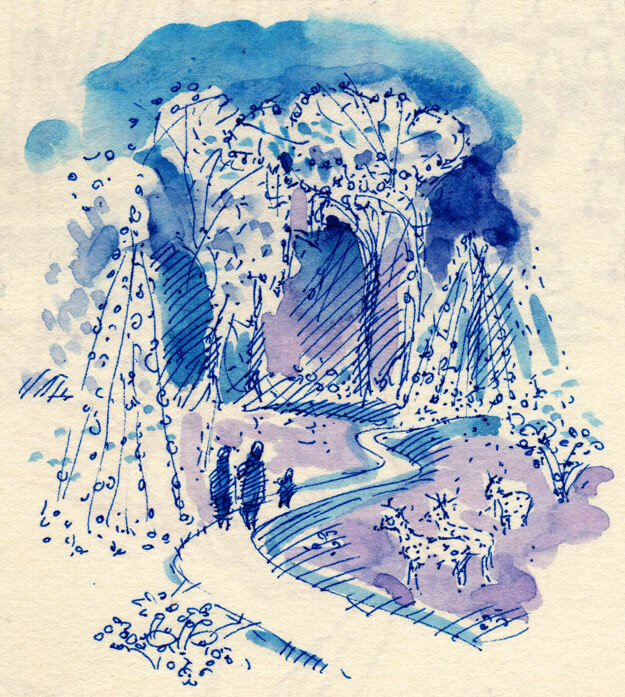 This sketch is from the Smithsonian’s wonderful Seasons of Light at Discovery Theater, which each December describes and dramatizes winter festivals of light from many cultures. 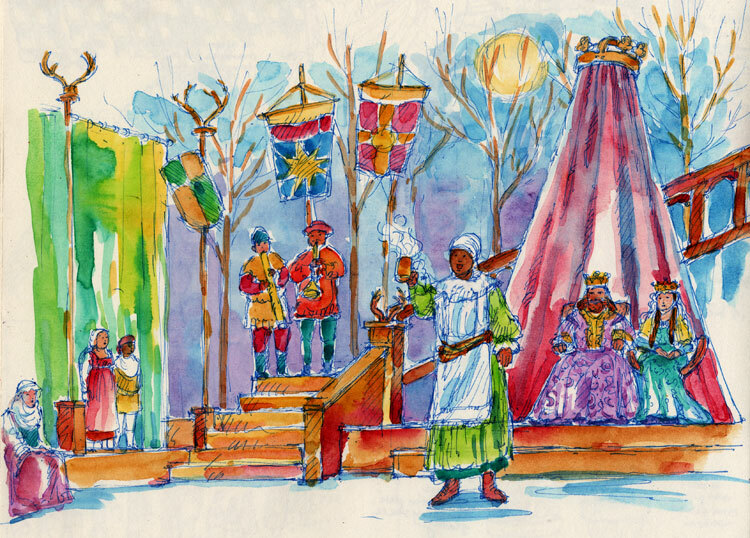 From my sketchbook, a medieval Revels. And so the Shortest Day came, and the year died. Twelve years ago today I was in labor. 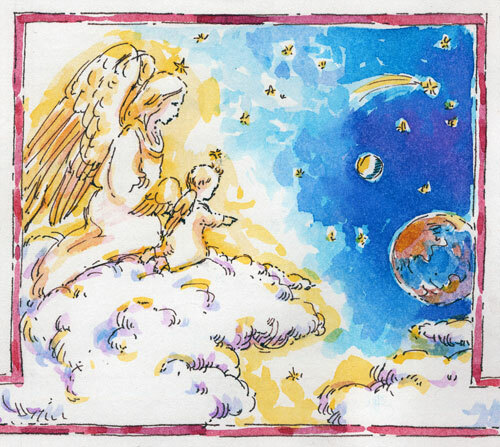 I had been in labor since dawn of the winter solstice the day before. 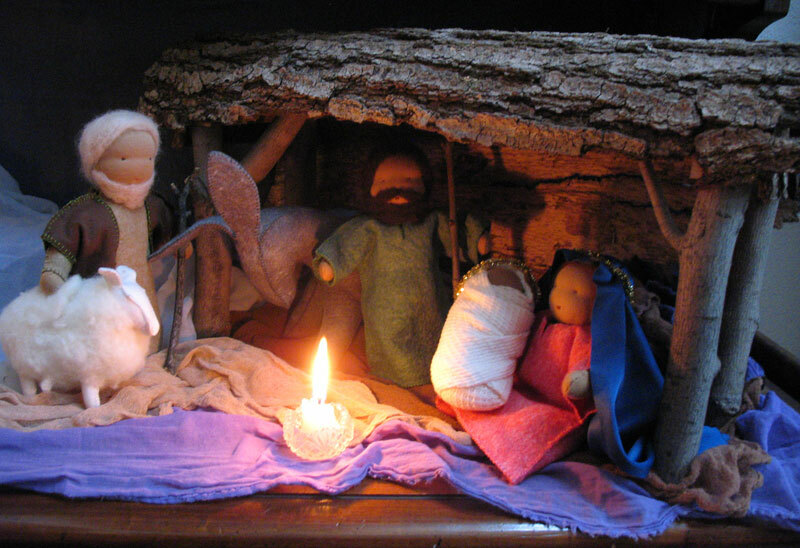 We said: A solstice baby! Uh, no, guess not. Labor would continue for another two days… My daughter was contemplating the looooong journey ahead of her. Then she was ready. You go girl! 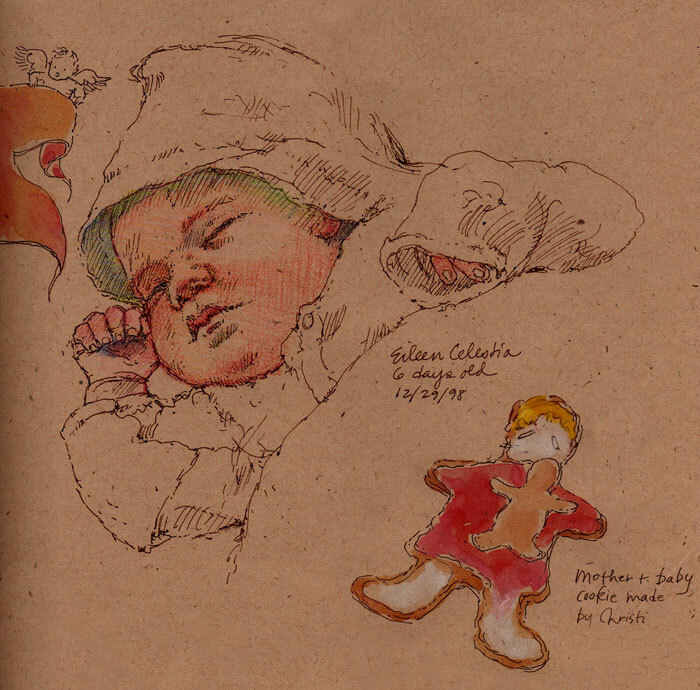 These sketches are from a baby journal I began after our daughter was born. Not the same day though. I’ll still be [ ] years old tonight. Tomorrow I’ll be [ ] years old. [ ] candles on my cake. 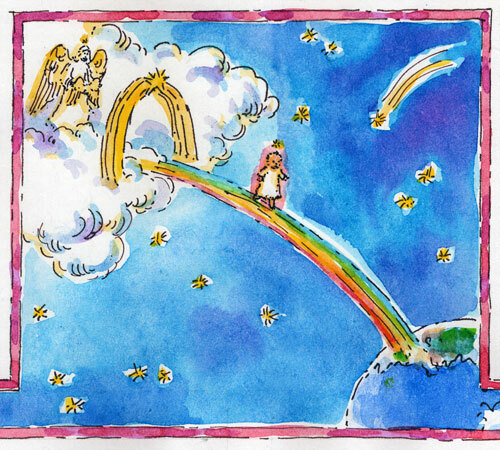 You are currently browsing the Each Day Is A Celebration blog archives for December, 2010.